Retractable leashes are leads that extends and retracts in length. These leashes are not recommended for dogs of any size in an urban setting. Since the retractable leash extends in length with movement from a dog, there is absolutely no control, and it can cause serious danger– from jumping into the street towards moving cars, launching at strangers, getting tangled on various objects, or getting caught in elevator doors. While there is a locking mechanism to reduce the length, it is not reliable. The flimsy cord can easily be cut through, and the handle is too bulky and clumsy to provide a firm grip. It is the worst invention for dogs. 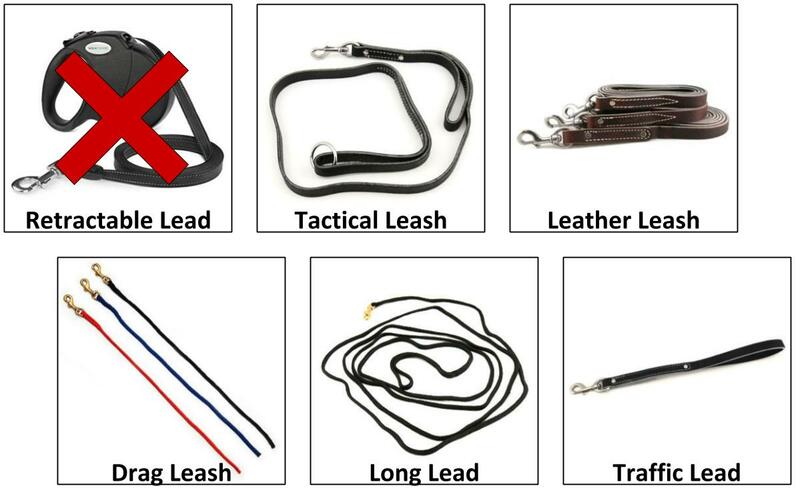 Tactical leashes are leads that provides a handle close to the collar and at the end of the leash. It’s a fantastic training leash, and perfect for the urban environment as it allows the handler to keep the dog close or provide more slack depending on the environment. It’s a sensible choice for all dog owners in NYC because it allows you to keep your dog close and obedient when necessary, and loosen where space and circumstance permits. Leather leashes are fantastic as it’s strong and durable. It softens with time, and starts to mold to the grip of your hands. I highly recommend leather leashes for large breeds as you’re able to correct or control the dog swiftly with a well seasoned leather leash. Leash length should be chosen based on your dog’s behavior and temperament. If the dog is learning how to behave, the shorter the better. Leash length is a privilege earned by well behaved dogs. If you have a stiff, brand new leather leash, soak it in hot water, a little dish soap and vinegar. While it’s still wet, knead it with your hands to soften then allow it to try. Repeat this method, and you’ll have a well seasoned, soft leash that is easy on your hands. Drag leashes are not for walks, but an excellent tool for training. The light, short leash dangles on their collar so you can easily direct and train your dog to reinforce house rules or basic obedience. Long leads are also not for walks. It’s a lead that’s anywhere from 8FT to 100FT in length for training purposes. It’s an essential tool to reinforce recall and basic obedience from a distance. The traffic lead is a very short leash (usually 1′ in length) that’s primarily used for crowded settings, or if you want to keep your dog very close. The dog can only travel as far as the length of the leash, so this one gives full control of the dog, which is perfect if you have a reactive dog that tends to get himself in trouble, or to safely maneuver through the common areas of a densely populated building.